Fletcher played a key part in developing GM's Super Cruise hands-free highway driving technology. DETROIT -- General Motors has promoted Pamela Fletcher to the new position of vice president of global electric vehicle programs. Fletcher, 51, most recently executive chief engineer for electrified vehicles, will oversee an electric vehicle program that aims to launch more than 20 EVs by 2023. She will assume her new role immediately. Fletcher will report to Doug Parks, vice president of autonomous and electric vehicle programs, the company said Thursday. "Nobody is more prepared to help us lead the way to a zero emissions future than Pam Fletcher," Parks said in a statement. 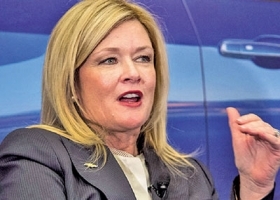 Fletcher -- a 2015 and 2016 Automotive News All-Star and one of Automotive News' 100 Leading Women in the North American Auto Industry in 2015 -- had a substantial role in engineering GM's EV options. She oversaw the development of the Chevrolet Volt plug-in hybrid, the Chevrolet Spark EV, Cadillac ELR and the Chevrolet Bolt EV -- which won 2017 North American Car of the Year . She also played a key part in developing GM's Super Cruise hands-free highway driving technology.